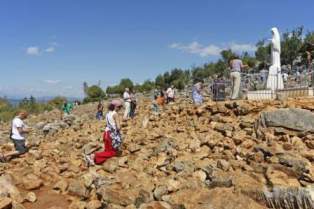 Apparition Hill is the site of Our Lady’s first apparition in Medjugorje, and many other apparitions since then. Access is from a footpath leading up from the village of Bijakovici. Our group started the climb at 6am, picking out a path among the jagged stones on the ground. Listening to the murmuring of repetitive Hail Marys, viewing the bareness of the Hill combined with the scattering of crosses and plaques, remembering that Our Lady had chosen this special place, all had the effect of making us treasure this special moment in time. It is here, of course, that a permanent sign will be left once the apparitions have ended. Father Jozo was the parish priest in Medjugorje in 1981 when the six village children relayed visions of the Virgin Mary. This brought on Communist oppression in the village and Father Jozo’s torture and imprisonment. In attending his church service, the church was filled to capacity, so we stood, knelt, or sat on the floor where we could. Father Jozo gave a rich, spiritual insight in the meaning of Medjugorje. After he finished his talk, several priests passed among us and invoked each of us with the Holy Spirit. Some people reacted to the invocation by passing out, being “slain by the Spirit”. Each of us was given a Rosary at the end of the service. This is the same church where on 7 February 1945 Communist soldiers slaughtered 30 Franciscans because they refused to remove their habits. Their bodies were burned in a nearby cave where their remains lay for many years. Today they are buried inside the Franciscan church. 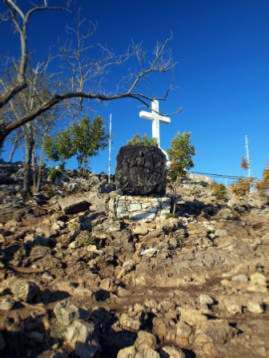 The Cross of Mount Krizevac is the most significant and dominant feature in the landscape of Medjugorje. It helps us to see why Our Lady chose this village and region for the manifestation of her love and concern for her children on earth. Overlooking the church of Saint James and visible for miles around the valley below, this Cross speaks powerfully of the strong message of penance and atonement which Our Lady has brought to the world. It does so, not only by reminding us of the suffering of Christ, but also, in a special way, through the story of its construction. The 15 ton concrete Cross was constructed by the people of the area in 1933 in thanksgiving for the cessation of crop damaging hail storms, and to commemorate the 19th century of the Redemptlion. We were privileged to climb Krizevac today, a hot, strenuous, but uplifting journey. The Stations of the Cross were meditated upon on the enduring, but inspirational climb. Two of our group, Father Trevor and Theo, had a very hot and tedious journey down Krizevac. A woman, who claimed to have had the ‘evil eye’ by another woman climber, took ill and clutched our two group members for support. Father and Theo really struggled down the mountain, supporting the woman as she wouldn’t let them form a cradle with others to enable her to be brought down efficiently and more quickly. Our two warriors could certainly claim to have done their good deed for the day! 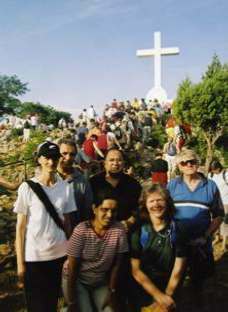 10pm Apparition on Apparition Hill - Ivan - Our group gathered around the Blue Cross, preparing for Ivan’s vision. A couple of thousand people were up at the top of the Hill - some were there as early as 5pm - waiting for Ivan’s apparition there.